Roger Duvollet 1911 – 2016 (PE nr. 1078) | M.Afr. Roger was born on the 27th August 1911 at Vesoul in the east of France. He entered the Junior Seminary of Luxeuil in 1921 followed by studies at the Major Seminary of Besançon. He contacted the White Fathers in 1933 and in October of that year, he was admitted to the novitiate at Maison-Carée, Algiers. On the 1st October 1935, two days before the feast of St. Theresa of Lisieux, (then observed on the 3rd October), he took his Missionary Oath at Carthage. He completed his studies in Carthage, near Tunis. He was ordained priest on the 29th June 1936 also in Carthage. On the 12th July 1936, he celebrated his First Solemn Mass at Scey-sur-Saône about 20 kms. from Vesoul. The preacher was Fr. 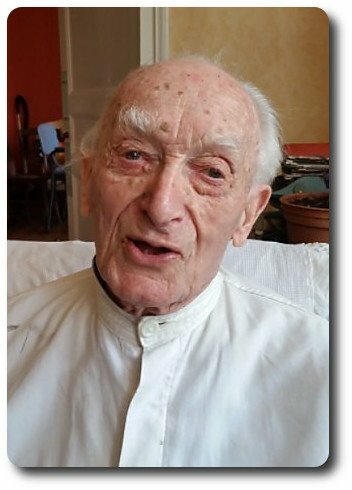 Louis Groshenry (+1962) who would become Apostolic Vicar of Bobo-Dioulasso and where the present Parish Priest of Scey-sur-Saône comes from, Thus in some way, closing the circle! After his ordination, Roger returned to Tunis to study Arabic at IBLA, (Institut des Belles Lettres Arabes). He finished his studies in September 1939 and he received an appointment to Algeria. He began in El Goléa, (now El Ménia) where the tomb of Charles de Foucauld is located. On the 1st December 2016 this year, we celebrated the centenary of his death in Tamanrasset. However, his body was transferred to El Goléa, 1,000kms away, on the 26th April 1929 because of the remoteness and insecurity of his burial place. When war was declared on the 3rd September 1939, Fr. Duvollet was called up to serve in the French Army in Tunis. In October 1940, he is in Geryville, now El Bayadh, in the high plateau of Algeria. In September 1941, we find him in Algiers. He was mobilised again in October 1942 and stationed in Thibar in Tunisia. In November 1945, when the war was over, he was appointed to Colomb-Bechar (now Bechar, in southwestern Algeria). He made his Long Retreat at Mours in July 1951 and returned to Colomb-Bechar. He was chaplain to a number of Scout groups for boys and girls, which included Christians, Jews and Muslims. In October 1959, he was in Biskra in eastern Algeria followed by a stay in Djelfa on the high plateau noted for its very severe winters. We should not conclude that he was a rolling stone; in fact, on the contrary, he was ready to help or replace any confrere who was absent, isolated or sick. In March 1962, Roger was appointed to Ouargla in the south west of Algeria. He lived at Hassi-Messaoud about 80 kms. away. This was the centre of the recently established Algerian oil industry. He was to remain there for 11 years. He visited the camps of the workers who came from Algeria, France and other countries. Every Tuesday morning he came to Ouargla to stay with the community leaving again on Wednesday afternoon. He was always faithful to this weekly rendez vous. He took part in the community exercises: Mass, breviary and house council. At table, he was very pleasant, even if at first sight, he seemed to be a bit aloof. His knowledge of Arabic was well above the average. He visited families and took a great interest in their conversations. Even if one did not always agree with him and his opinions, he had a captivating knowledge of the Sahara and its history. Fr. Duvollet was expelled from Algeria in April 1973. This was a terrible blow for him and it took a long time for him to recover. This needs an explanation. Certainly, Roger could be extremely frank. However, missionary life often suffers the repercussions of local political frictions and so one day, one becomes persona non grata, an undesirable, and it is made very clear to you that you should leave as quickly as possible. Missionary life and especially Islamic-Christian dialogue require patience, self-sacrifice, an acceptance of differences, listening skills and a certain flexibility. If the Father suffered because of this forced departure, it was for the reason that during his entire missionary life he had established a huge network of relationships. After this setback, Roger needed time to rest, look after himself, and come to terms with the change. Availability in missionary and priestly life never leaves you unscathed. Once he had recovered, Roger expressed the desire to live near his family. He took up residence in the presbytery of Scey-sur-Saône and worked in the Parish. In 1977, he went to the College Saint Georges at Vesoul where he taught catechism and he also did some supervision work. He was involved with a group of Scouts in Dijon. Fr. Duvollet began to write and undertook the publication of 24 volumes of Memories of North Africa. These volumes constitute a collection of 6,131 pages of Arabic proverbs, stories and memoirs as well as 11,835 photocopies or photographs of post cards and drawings of North Africa. All the documentation for these volumes came from the many relationships he maintained with the former residents of North Africa, Settlers, Saharans, former students, Muslim and Jewish scouts and the children of Harkis who were working in the Peugeot factory in Vesoul. In 1998, when he was 87 years old, he returned home and took up residence in his native village near to his family. The White Fathers are always keen to respect the choices of our confreres but at what price for their families. They are missionaries in their own way. It is a beautiful collaboration. Fr. Duvollet continued to wear his White Father’s habit consisting of gandoura and rosary; he said that he could see no reason to pass himself off as someone else. The village and parish of Scey-sur-Saône celebrated his 100th birthday. Last summer, Pope Francis imparted his Apostolic Blessing to him. Roger died on the 5th October 2016, having reached 105 years of age. Thus, his joined the Lord after 80 years of priesthood. His funeral took place in the parish church of Scey-sur-Saône on the 8th October 2016.